DALLAS, TX--(Marketwired - Dec 16, 2015) - Parks Associates released smart home research today showing 65% of U.S. broadband households trust the retail channel, including local and national retailers such as Best Buy and Lowe's, when purchasing a smart home product. 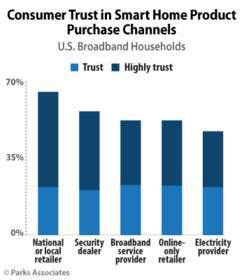 Security dealers are the second most trusted channel with 57% of U.S. broadband households. Parks Associates will address smart home consumer purchase patterns and retail solutions at the tenth-annual CONNECTIONS™ Summit: IoT, Entertainment, and the Connected Consumer, January 6-7 at CES® 2016 in Las Vegas. "Local retail stores are able to connect with consumers and provide interactive discussions that allow consumers to fully understand the capabilities and benefits of smart home products like lightbulbs, kitchen appliances, and door locks," said Tom Kerber, Director of Research, Home Controls & Energy, Parks Associates. "Innovative concepts in retail and sales channels, such as b8ta and Best Buy's Connected Home, are significant efforts to get smart home products into the hands of potential consumers." 360 View Update: Smart Product Adoption shows 53% of U.S. broadband households trust a broadband provider when purchasing a smart home product and 48% trust an electricity provider. Over 40% of U.S. broadband households intend to purchase a smart home device in the next 12 months. "At CES and the CONNECTIONS™ Summit, we will see new plans by companies to implement multichannel go-to-market strategies," Kerber said. "While a strong retail presence is required, positioning products in multiple channels will maximize reach and volume. For example, retailers, security providers, and energy providers are all expanding the market for smart thermostats, a market that has been historically dominated by the HVAC dealer channel." "The CONNECTIONS™ Summit at CES is a great opportunity to network with peers as well as learn about new strategies and developments in the smart home and IoT marketplace," said Kevin Garton, Chief Marketing Officer at Zonoff. "As the smart home market continues to grow, we are excited to partner with leading retailers, security providers, and ISPs to bring innovative platforms to life that offer new monetization strategies." "It's not enough to simply make cool connected devices anymore -- you need to help people use them," said Steve Thompson, Vice President, Business Development, PlumChoice. "Well-timed engagement throughout the customer journey helps users make informed decisions, drives adoption, creates product 'stickiness,' and establishes the provider as a trusted advisor. Maintaining sales and customer loyalty are examples of indirect monetization, but brands are also establishing new revenue streams through add-on services and support -- and consumers are eating it up." "The combination of data, analytics, and app engagement is key to delivering consumer value, which in turn provides the basis for monetization opportunities and multichannel distribution," said Amena Ali, Senior VP and General Manager, WeatherBug Home by Earth Networks. "Winning the consumer with intelligent and delightful IoT solutions will then help spur connected home market adoption and growth." "I'm excited to participate in the Monetization Strategies panel and look forward to sharing insights from EnergyHub's experience in monetizing energy management, including identifying new revenue sources and acquiring and retaining customers, and how what we've seen in energy translates to other areas of the IoT," said Seth Frader-Thompson, Co-Founder and President, EnergyHub. "The amazing thing about the smart home is that there are so many different benefits for consumers," said Letha McLaren, CMO, Icontrol Networks. "This can create a tricky marketing situation, though. As the smart home concept gains popularity, the industry needs to find the right way to highlight the value propositions that will resonate with quickly expanding customer segments." CONNECTIONS™ Summit: IoT, Entertainment, and the Connected Consumer will be held in the Venetian Hotel, Level 4, Room Marcello 4501. Sponsors of CONNECTIONS™ Summit include Cirrent, F-Secure, Affinegy, AirTies, Alarm.com, Carrier, CSS Corp, EVRYTHNG, Greenwave Systems, Icontrol Networks, MivaTek, NXP, PlumChoice, Radialpoint, ROC-Connect, Support.com, ULE Alliance, Vivint, WeatherBug Home, and Zonoff. For information on CONNECTIONS™ Summit, contact sales@parksassociates.com or call 972-490-1113. Follow the event on Twitter at @CONN_Summit and #CONNSummit16. During CES, visit Parks Associates at booth # 70,959 in the Sands. Registered CES media can register for a press pass for CONNECTIONS™ Summit at http://www.parksassociates.com/connsummit-press-request. Contact Holly Sprague, hsprague@gmail.com, to meet with an analyst or request specific data points. CONNECTIONS™ Summit at CES is an annual research and industry event hosted by international research firm Parks Associates at CES in Las Vegas. The executive event features two days of panel discussions on the smart home, Internet of Things (IoT), and connected entertainment, with trends and implications for connected consumers and opportunities for companies to build new revenues and innovative business models. Parks Associates will host CONNECTIONS™ Summit on January 6-7, 2016, in the Venetian Hotel, Level 4, Room Marcello 4501, during CES, which runs January 6-9 in Las Vegas. Follow the event on Twitter at @CONN_Summit. During CES, visit Parks Associates at booth # 70,959 in the Sands. For information about CONNECTIONS™ Summit, contact sales@parksassociates.com or call 972-490-1113 or visit www.connectionssummit.com.